Hello, Alex Trowbridge here, one of the graduate students in Dr. McLaughlin’s LACElab at NCSU. While I agree that it is important to proceed with caution when it comes to HUD’s in automobiles, I can’t help but feel that the benefits may outweigh the risks of using such an interface for certain functions. For example, most drivers (especially younger drivers) are already using a GPS on their phone, with or without voice directions, to guide them to their destinations. 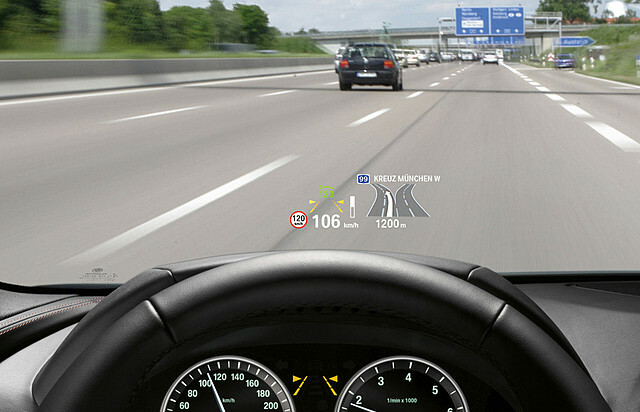 The same principle of variable mapping that makes the touch screen interface in the console more dangerous also indicates that a fixed location GPS navigation interface on the windshield is possibly less risky than one on a phone screen, that moves around and is almost certainly not located so near the area that most needs attended (i.e. the road). There are important design considerations for using this type of navigation interface (imagine an SUV following a slightly-opaque green arrow through a curve and plowing through the slightly-obscured obstacle), but I think with careful design this sort of display could be more safe than the interface currently used, a smart phone that keeps falling off my lap down by the pedals.